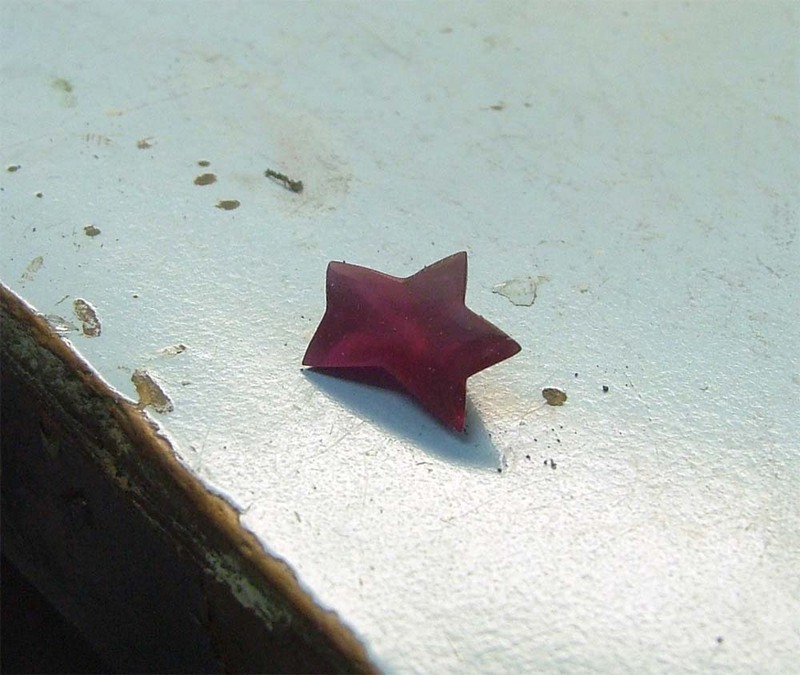 This is probably the toughest blog I’ve written since I’ve started exploiting my world of gem cutting and inlay lapidary. I wanted to start off by saying this. You never know how much you love someone until they are not around anymore. 2 weeks ago, I lost my grandfather. We are all tired of the same cliches but he was an amazing man. He lived life to the fullest, had 10 kids, experienced everything life had to offer. He was 92. You’ll always have a place in my heart. Ten years on and it’s still a daunting memory in the back of my head. I was lying in bed sick to my stomach when my mother comes into my room and tells me that a plane just hit the World Trade Center. I honestly didn’t comprehend it and went back to sleep. Ten minutes passed and I woke up again. I turned on my TV and all I see is a building up in smokes. I switch to the next channel and it’s the same thing. I then see another plane hit the other tower. I honestly thought I was watching a movie. My jaw dropped in a shock of awe. Was this really happening? I just graduated high school that past summer and I officially started working at my fathers company and it hit me: If this is happening in New York, could this happenin Los Angeles as well??? I jump out of bed and ran straight to my mother and she was on the phone. I waited impatiently waiting to ask her “what’s going on with dad?” She was on the phone with my father and he was on his way home. 9/11 is a very sensitive subject and ten years since I’ve seen this Jewelry industry take a dive like no other. 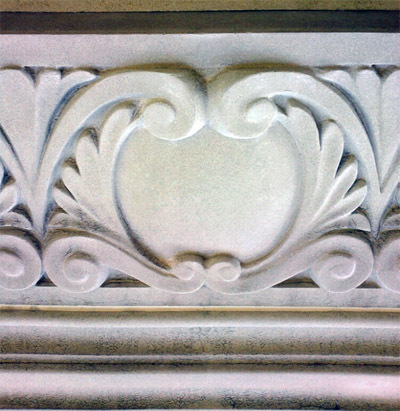 Manufacturing that was done in the USA was moved overseas to deal with economic downturn. People that came into this business 15 years ago have been flushed out. I was talking to one of my customers yesterday and he was frustrated that the old age of knowledge was not there anymore. The new generation wasn’t getting involved to keep this craft going. I was speaking to another customer of mine who called me and asked me if I was driving (speaker phone of course) and I was like “yes, I have to drive to deliver jobs. It’s a service I have to provide to keep some of my customers happy.” I’ve flown to San Francisco to drop off a job outside of the gate, then hopped onto another plane 15min later and flew back to Los Angeles. Work used to come to my doorsteps but now I chase after it. I mean, it’s all for the better right? I’m always trying to stay on top of my game and this is why I started exploiting my work while trying to educate people. My father, being old school, thinks that people would get offended by me using the word ‘educate’ when I write my blogs. I’m not trying to offend anyone but if it’s put out there for people to learn something new, then why not? 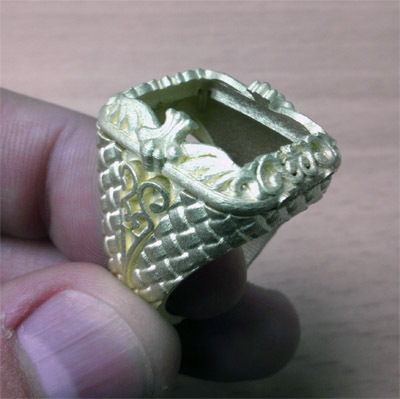 The National Jeweler had an interesting piece about jewelers reflecting on 9/11. If you’re interested in reading it, click on the link ‘here‘. My prayers are with those who lost their lives to protect this great country. Onto the business end of my blog which contains a few things I’ve been working on. 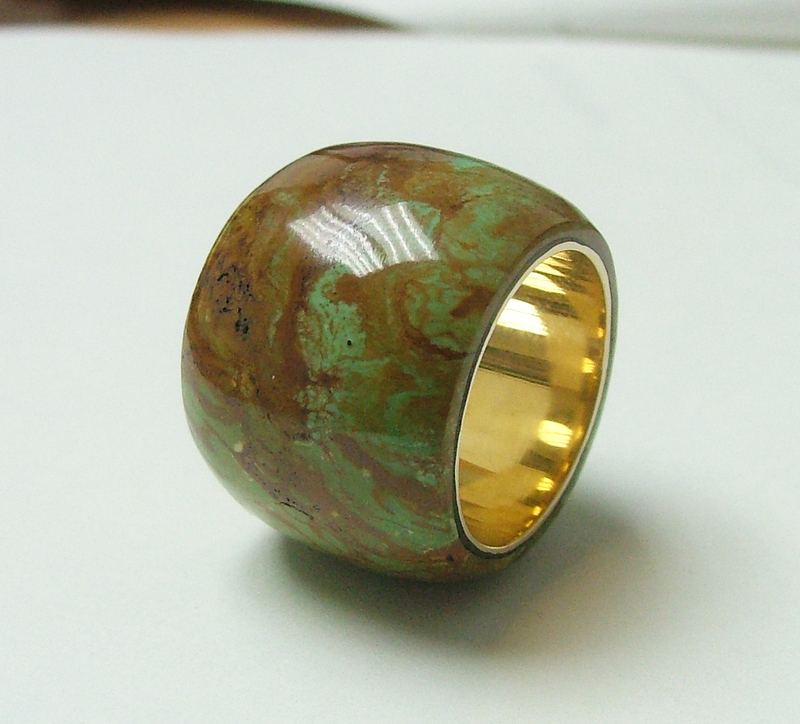 For those that haven’t read my ‘Turquoise Grooves’ blog, I received another job similar to the grooved, oval shaped turquoise with a high cabochon. 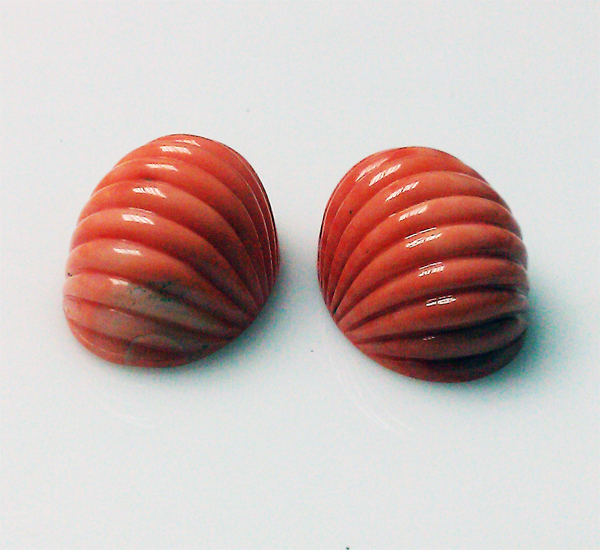 I needed to cut out of rough some salmon color red corals, matching pairs. 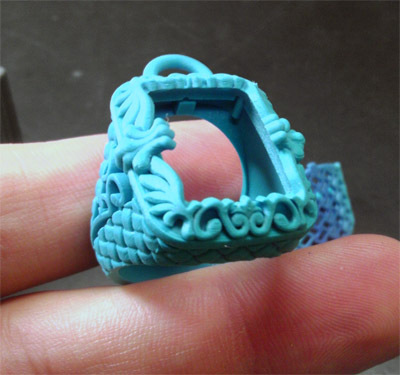 I gave a detailed breakdown in my turquoise groove blog so click on the ‘link‘ and have yourself a look. I love the color on these corals. They came out great and that high domed look just makes the stones for me personally. 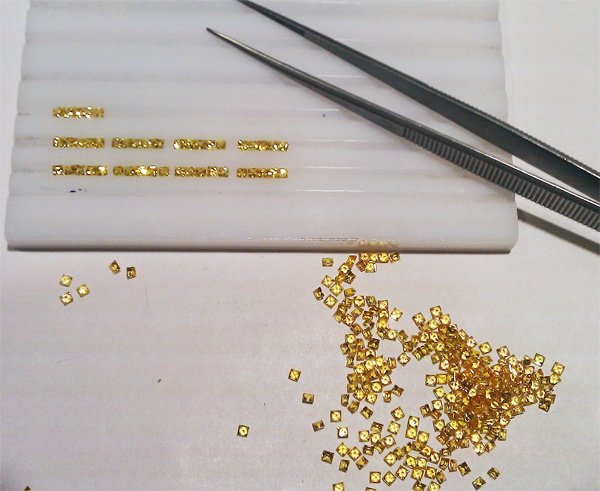 I’ve also been working on this special order involving 2mm princess cut yellow sapphires. For those who haven’t sorted through a parcel of color stones, your eyes start playing tricks on you when you are trying to match a color. 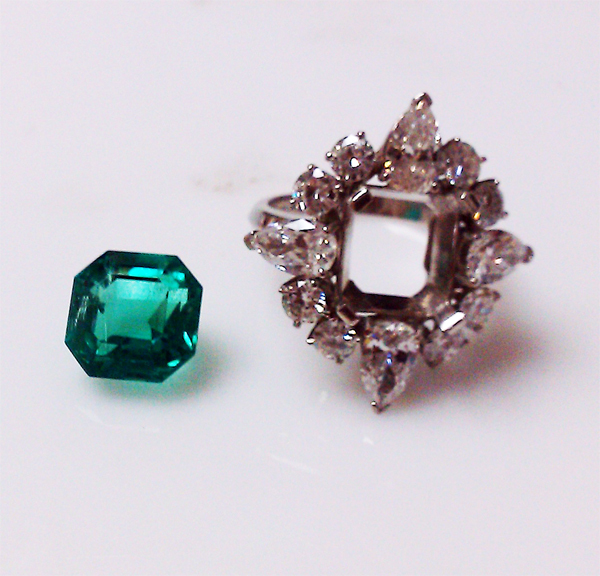 For those who were wondering, I oil emeralds. Oiling is one of the oldest treatment in the world. 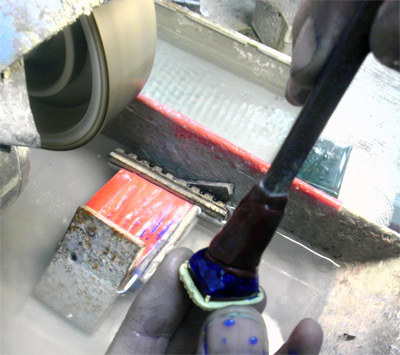 Oiling improves the clarity of the emerald. 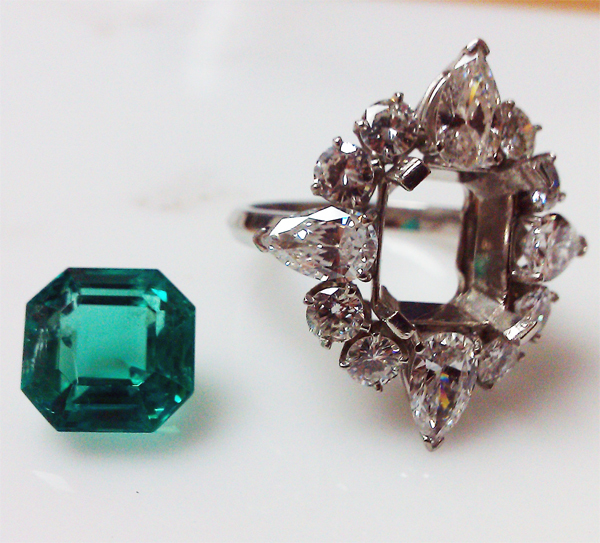 I received a job like this that needed a light polish on top with oil treatment after on a cut cornered, step cut emerald. 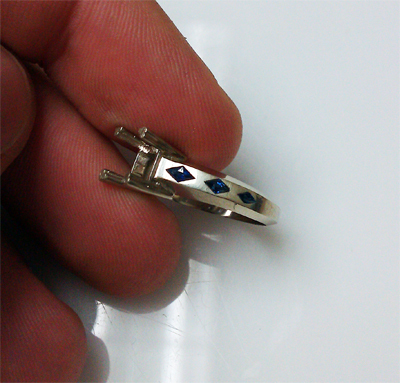 I had my setter remove it from the setting of this diamond filled ring. 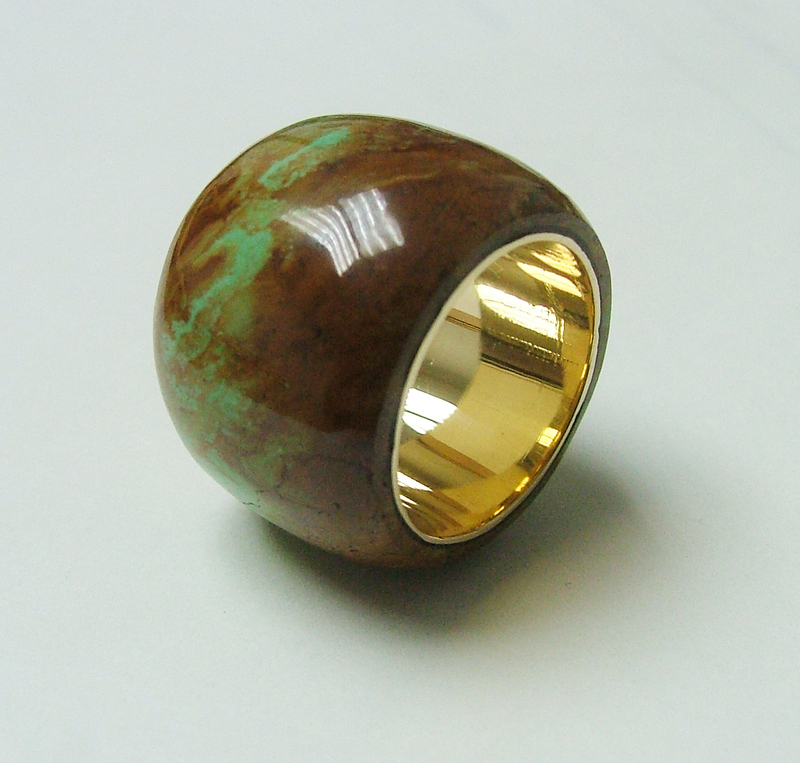 I polished the stone and oiled it. 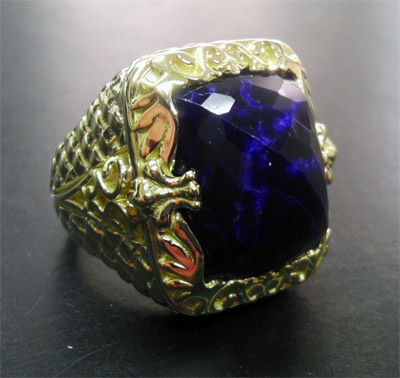 I don’t know if you can tell, with the image but with the naked eye you can tell right away at the enhanced clarity of the stone. 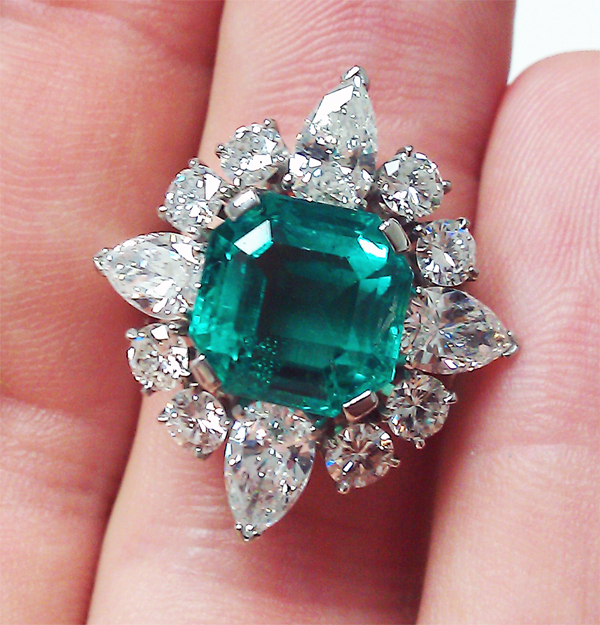 I used a little flash to show off that beautiful green color this emerald gives out. I had my setter set the emerald back into the mounting. 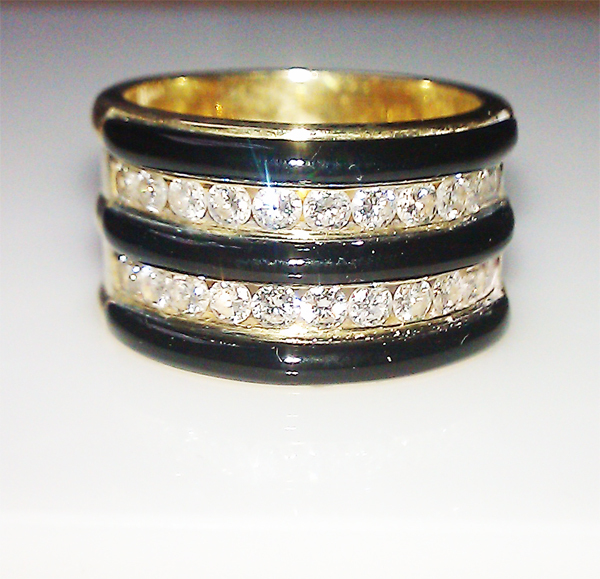 This ring has such a mature and classy feel to it. 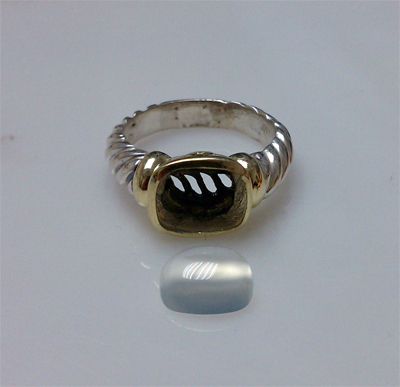 For my next job I received this ring that needed 3 rows of thin onyx, inlaid, replacing the cracked and broken original onyxes in the yellow gold ring. I removed the old onyx and inlaid 3 new pieces of each row. With jobs like this, you need to be patient and have a light touch or you’re starting this job over. 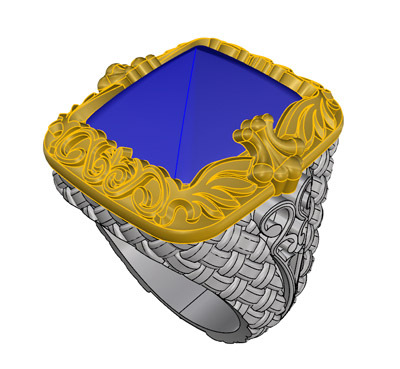 Here’s a front view of the ring. What makes this job even more difficult is that it sits above the setting and it’s rounded surface gives it that more expensive look. 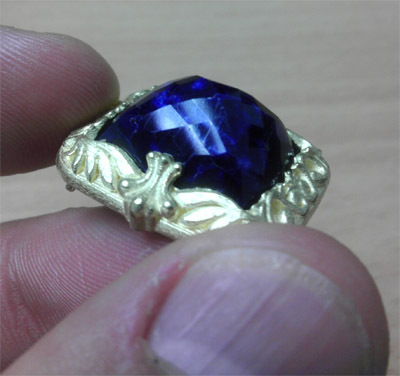 Hopefully by Friday, I’ll have another blog up on this crazy Tanzanite project I’ve been working on. The weight loss that these two beauties went through just for a fancy cut was ridiculous. Busy. This is somewhat of an rare occurrence in the jewelry world during June at times like these. 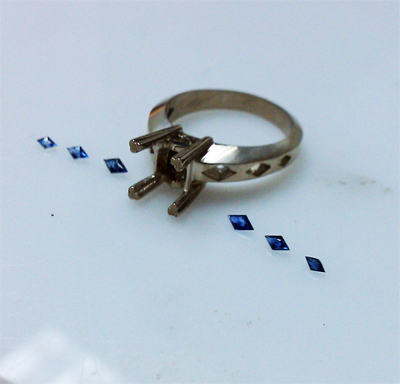 I’ve been busy finishing up some inlay work with some gem cutting and my special orders have picked up as well for me. I’m not complaining nor am I not getting ahead of myself, just keeping it ‘solid’ – as a UPS security guard named Jay once told me. Work used to show up on my doorstep back when it was real good. Now, you have to chase after it. Times have changed and most of you reading this are being introduced to my blogs via email while I try to generate interest in the work I do. But I digress. 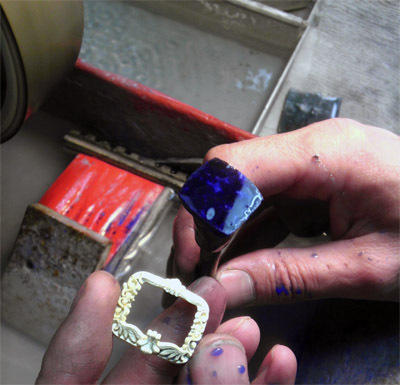 This blog entry is an homage to one of the most exclusive Los Angeles jewelry designers I’ve had the privilege to work with. Lena Wald, the Modern Rocker. Who is Lena Wald? As always, I’m glad you asked. She graduated from Sarah Lawrence College in Bronxville, New York. Like most of us out there, we have a puzzled look on our faces after we graduate asking ourselves, ‘what the hell now?’ Lena always had an interest in the arts so she moved back to LA where she started doing wardrobe styling for commercials, print ads, etc. 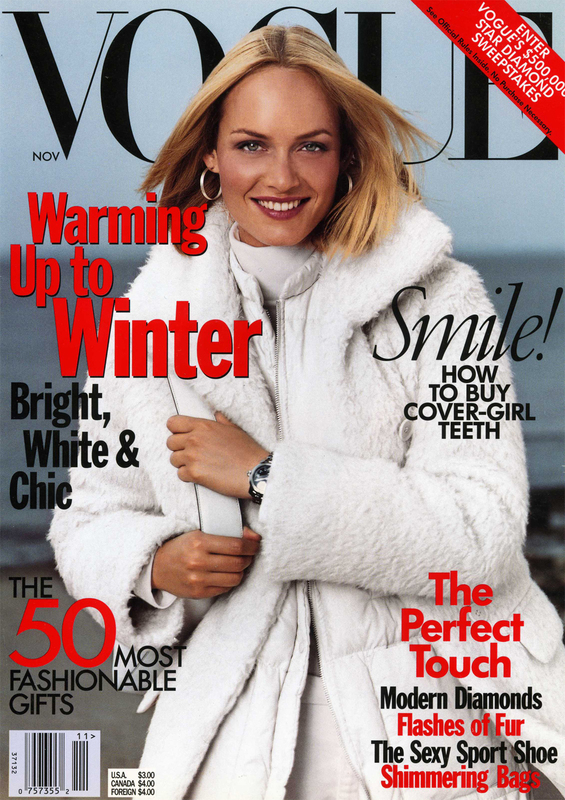 She later moved into the magazine world working for publications such as L.A. Style and InStyle. Over time, she realized that the magazine industry was not for her. But she always had an interest in fashion and design. So she pursued a job at Richard Tyler (a fashion house in L.A.). Lena was hired as the assistant to the fabric buyer Lela Rose. After 3 months, Lela Rose left to start her own clothing line and Lena was promoted to fabric buyer. She saw this as a great opportunity to begin making a name for herself. Along the way, she met some of her closest friends at Richard Tyler and made some incredibly good contacts. Her job allowed her to travel to Europe twice a year for fabric shows. 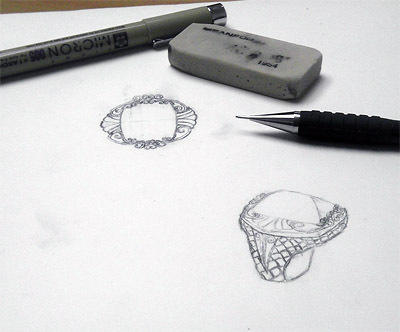 After three years at Richard Tyler, she felt like she gained enough experience to start a jewelry line. (This is where I come in). 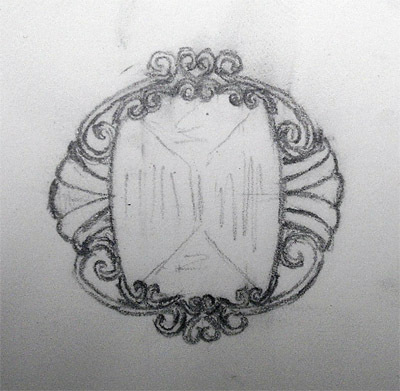 Lena’s ideas usually begin with something that she wanted to make for herself to fulfill her unique style. 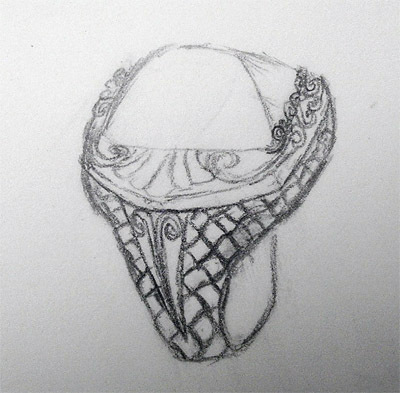 She wanted a ring carved out of a solid ruby. The 1st sample she made, came out so well, that she brought the idea to Maxfield (A prominent fashion retailer) and they immediately placed an order. 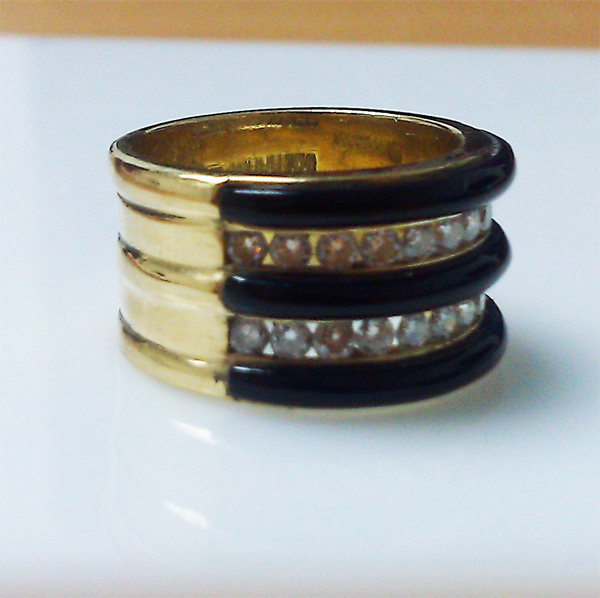 The rings are made from natural stones, such as turquoise, ruby, black onyx and crystal. She was fortunate enough receive press in W magazine, Vogue, Bazaar, Elle, and other famous publications. 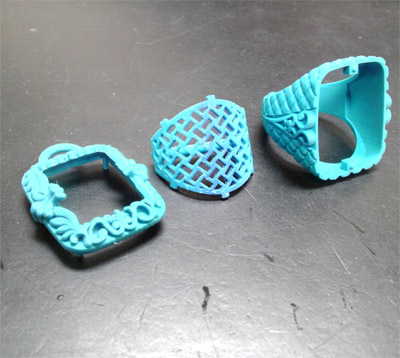 She began to further expand her line to include necklaces and bracelets. 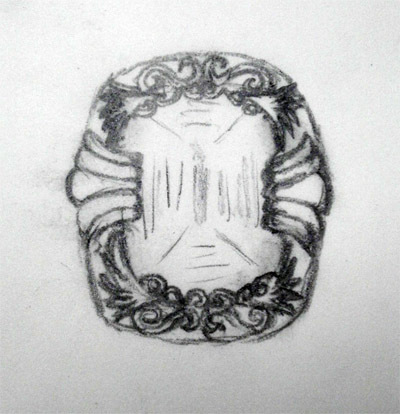 But then she had a completely new idea which spawned from her need to get herself some diamond-initial earrings. Here’s Lena Wald’s Vogue magazine spread. People love anything personalized. You name it and you can get it personalized to your liking. 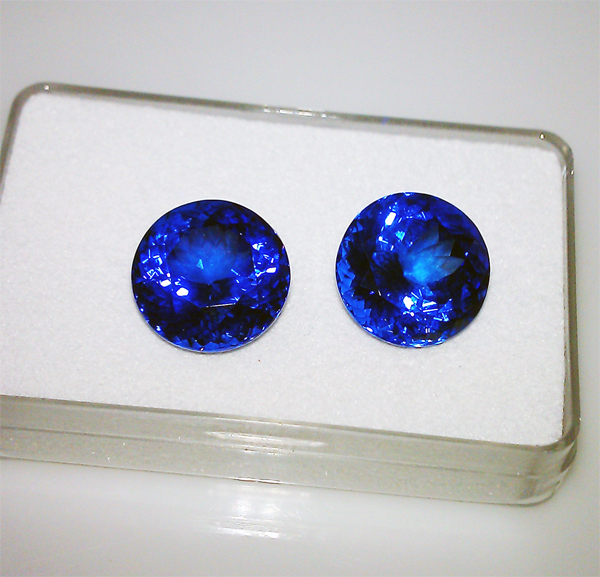 The earrings have been very well received by stores and their customers. Even Cameron Diaz wore her ‘C’ and ‘D ‘ earrings to the Oscars. look who’s ring she’s wearing. This was a screen shot from the movie called “The Sweetest Thing”. 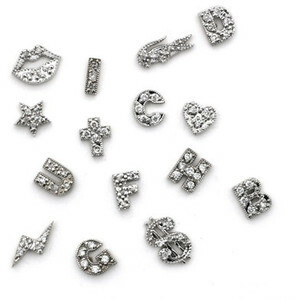 These are the diamond initials and charms from Lena Walds line. This line has expanded into many different styles of trend setting necklaces and earrings made in yellow, rose, and white gold with a choice of either plain, adorned with diamonds, or set with other precious stones. 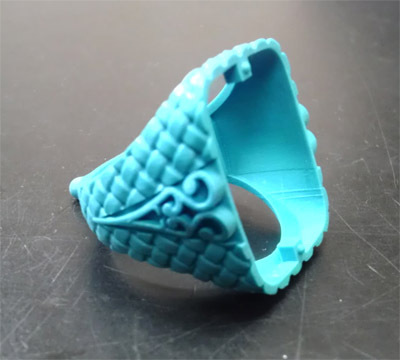 Lena’s business has grown significantly over the years and many stores and websites carry her jewelry worldwide. 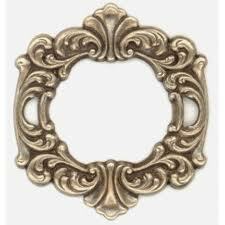 She has a great following among stylists and many celebrities have been seen wearing Lena’s jewelry including Kate Moss, Gwyneth Paltrow, Madonna, Kate Bosworth, Charlize Theron, Reese Witherspoon, Katie Holmes and according to Lena, her favorite out of the bunch, the first lady, Michelle Obama. Hope you liked my little introduction to the Modern Rocker herself, Lena Wald. 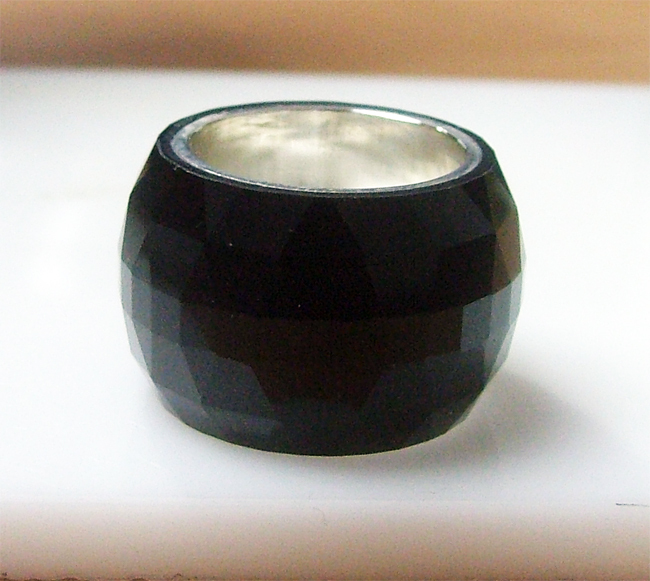 Now on to this onyx I was commissioned to make for Lena. 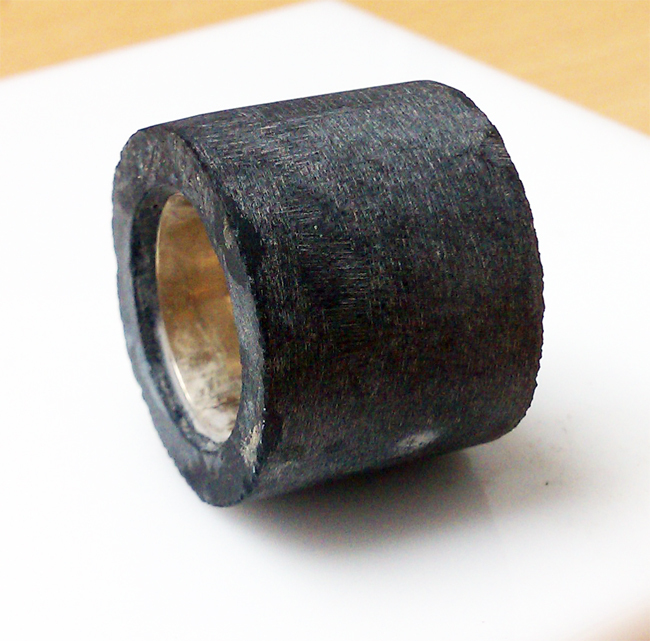 I can’t give you a 100% breakdown and you’ll notice certain steps are missing, but you’ll get a basic idea on the process that goes through making this ‘Cigar Band’ faceted onyx with silver lining. 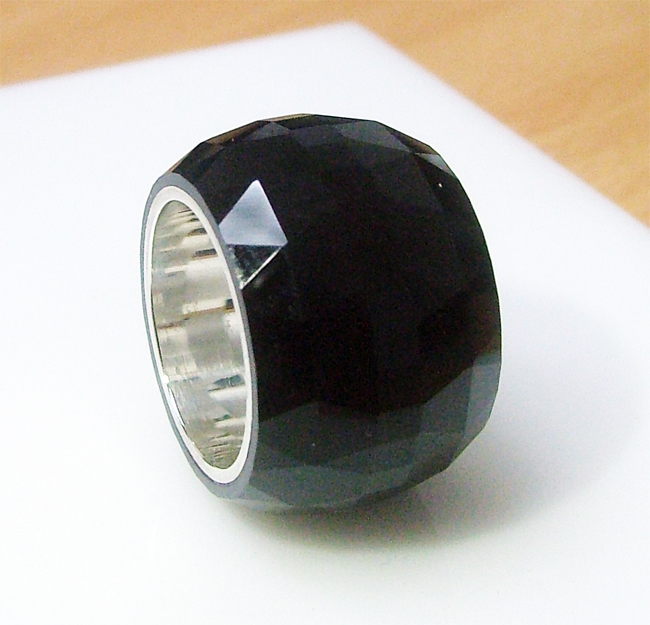 The silver lining insert is at 7.5 finger size which will sit inside the onyx. 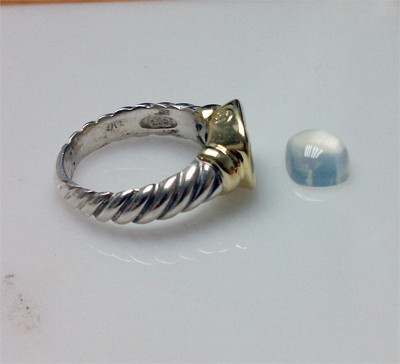 The silver lining surface is made purposely rough so when I glue it into the onyx, it will have a tighter grip to avoid sliding around. 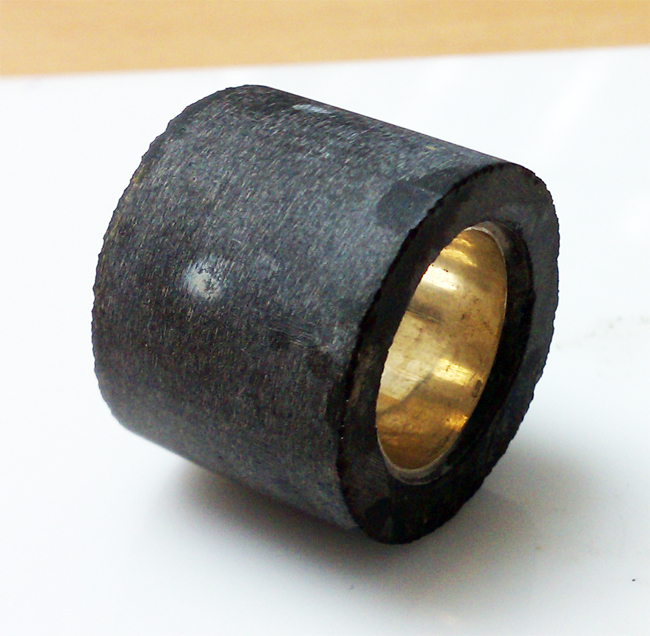 I drilled through some onyx rough and glued the silver insert into the onyx. 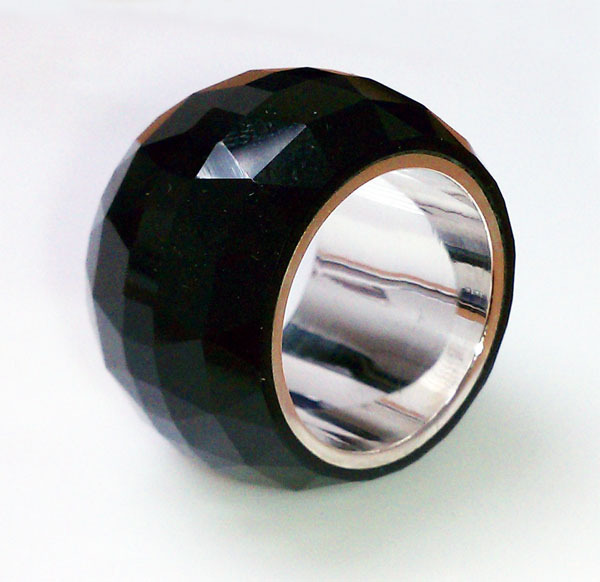 The onyx was pre-formed to this perfect round, cylinder shape. 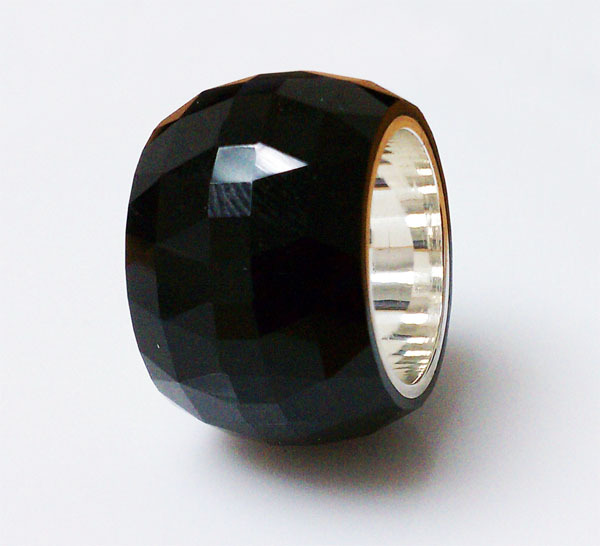 Fast forward through all the cutting and faceting and you get this beauty! 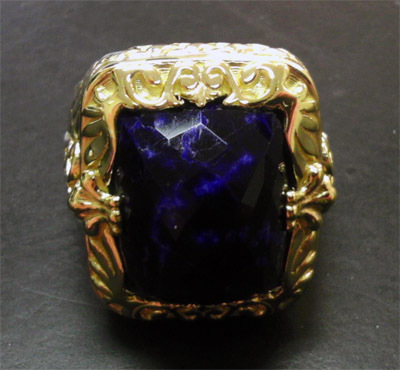 Notice the domed curvature on the onyx. 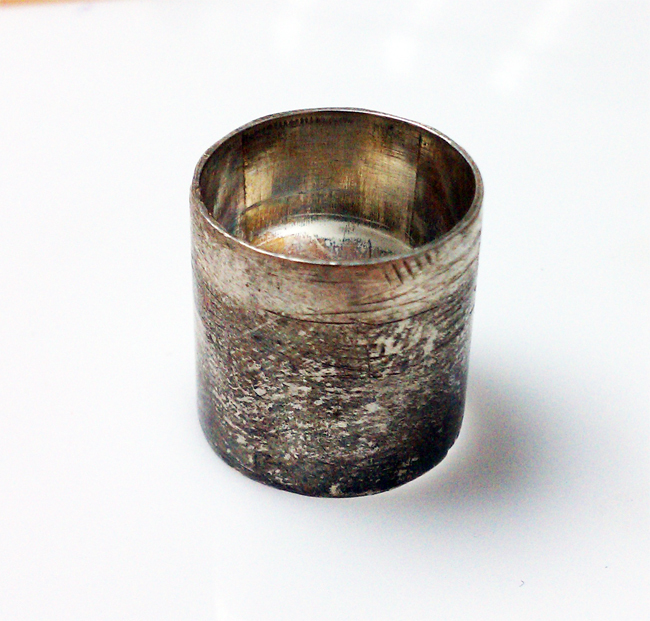 The inside of the silver lining has a high polish to it. 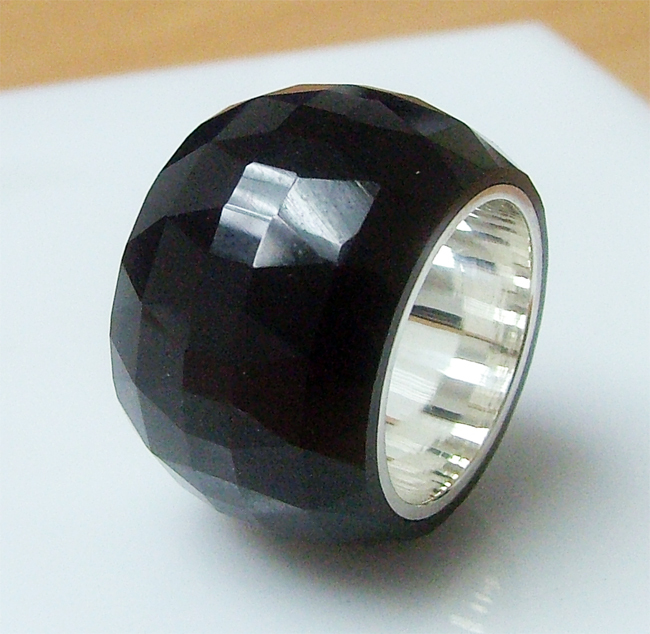 I introduce to you, the Cigar band faceted onyx ring with silver lining. Here’s another one I made a while back. 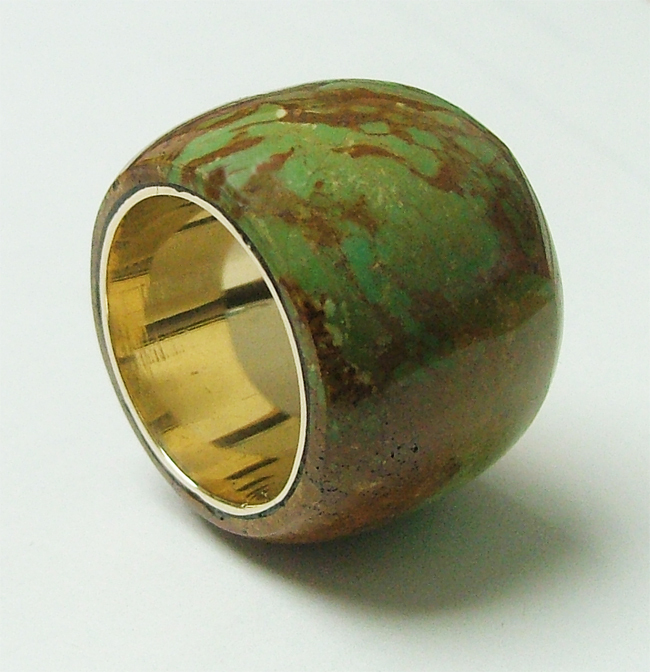 It’s beautifully cabbed with a gold lining insert with a high polish. Killer stuff! And my favorite piece. 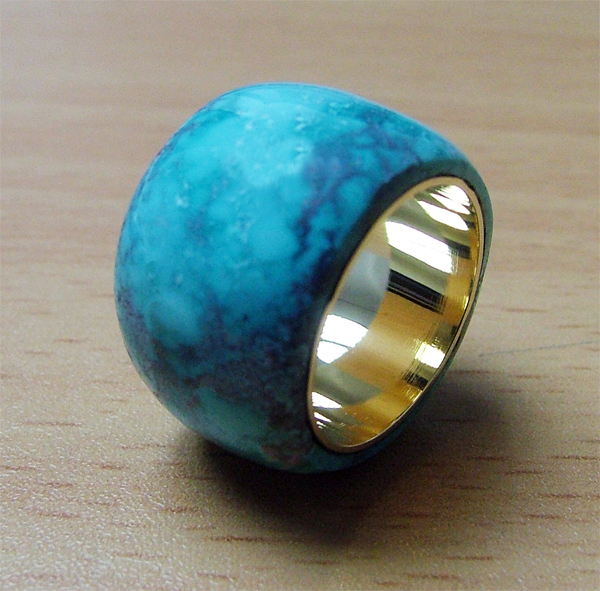 The classic blue turquoise piece with a nice high polished cabochon with a gold lining insert. 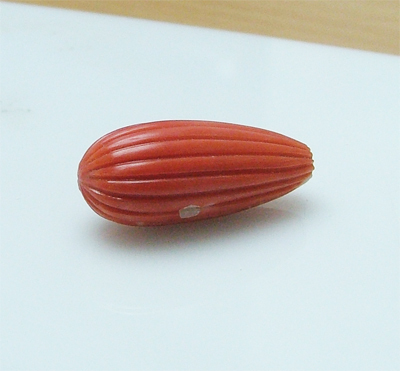 I added a small video clips to see how the process is done. Next, I need some white mother of pearl. 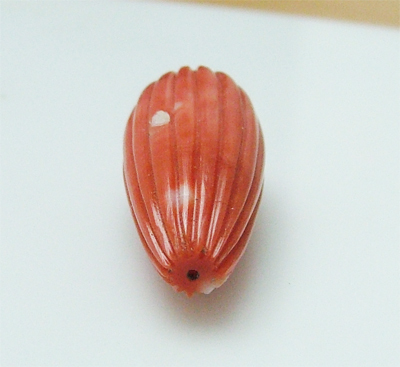 I find some white mother of pearl shells that I can cut material out of. I use my saw again to complete this process. I prep that part out and here comes the most difficult part. 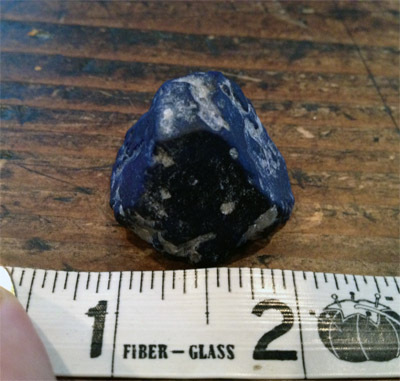 I need to pick three sections around this lapis where I need to fit free-formed, eye shaped white MOP’s. I carefully map out my spots and I get on my bench. I use a hand-drill and start opening a slot to where I can inlay this MOP. Oh yeah, I forgot to mention. 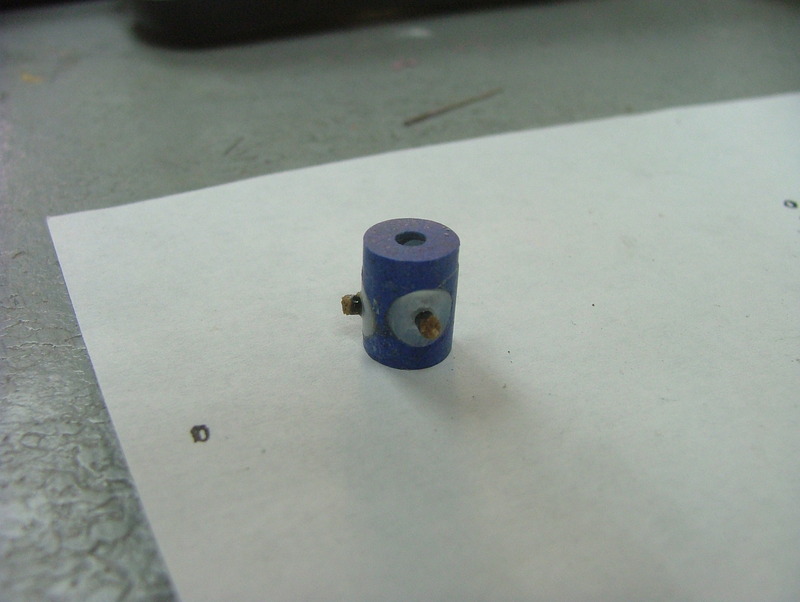 I need to include a 3mm thick hole that goes through from one end to the other. That should be the first step in the process before creating inlay slots for the white MOP. When drilling into anything, water is your best friend. Friction and heat will cause things to break or crack. 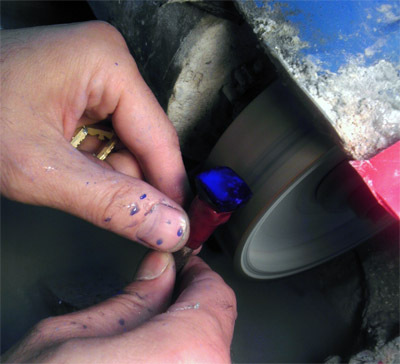 Keep that in mind when drilling gemstones. Anyway, after a few hours of creating inlay slots for me to inlay the mother of pearl; I check the whole stone to see if there are any cracks or inclusions that would break this thing. Everything panned out fine and on to the pre-forming machine. I get the white MOP close enough to ‘exact fit’ and move to the bench. 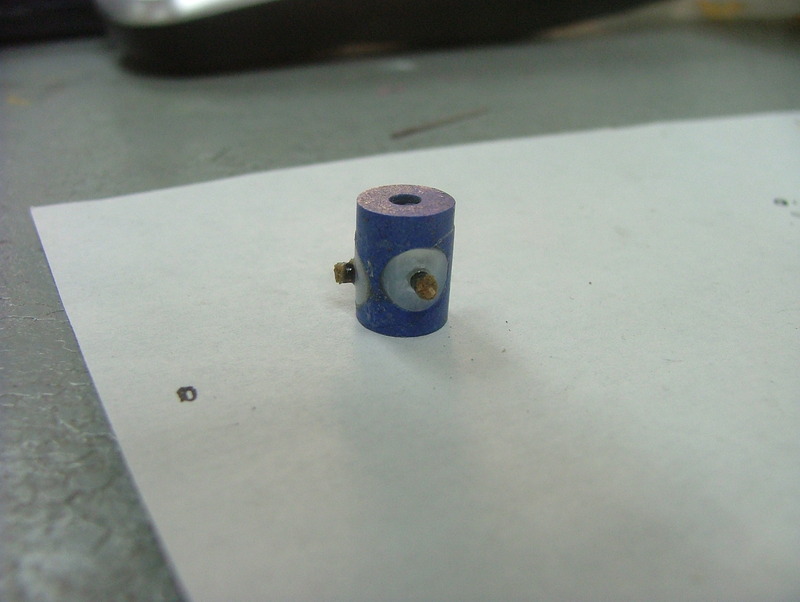 With the hand-drill I slowly start shaving off the walls and see how and where I need this thing to fit into the lapis. 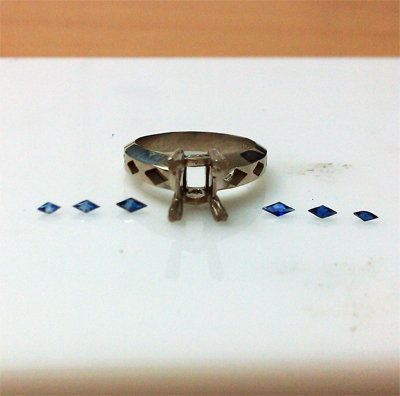 It’s sort of a ‘trial and error process till you get it fitting completely. 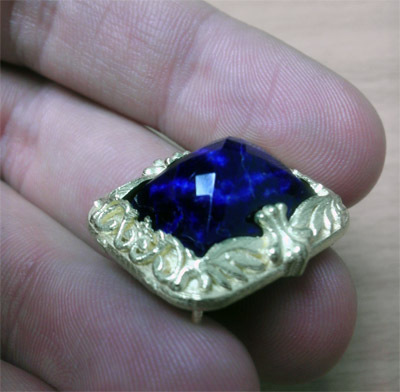 Once I’ve fitted all three white MOP’s into the lapis. I start the epoxy process, aka, glue. Once I get my freshly drilled holes in place, time to insert 2mm sized onyx’s to fit for my pupils… Before I continue, I was having my coffee at the local coffee shop here in downtown Los Angeles and one of my coffee buddies was telling me a story about some Armenian liquor store guy. He had a giant evil eye hanging on the wall and he asked him, ‘Hey, what’s the deal with the big ol’ eye hanging behind you?’ The man grabbed an old, 8×10 photo and replied, ‘this is a picture of me when I was a child and I was told that I was a beautiful child at the time of the photo was taken.” The man then pointed at himself and said, “Do you see what happened to me after someone told me that I was a beautiful child? This is why I have the eye hanging behind me.” I thought I’d share that. I found it ironic and funny at the same time because I’m blogging about the evil eye. 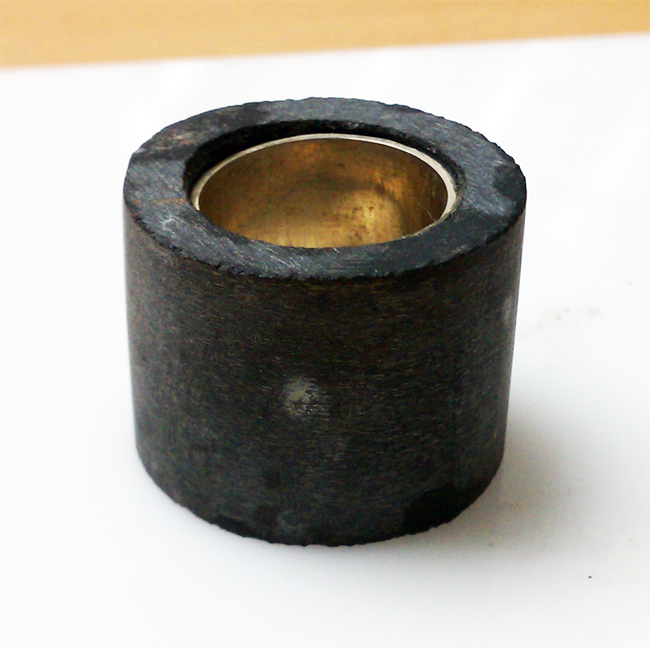 Anyway, I was just talking about how I needed to fit 2mm sized onyx into the slots I just made. 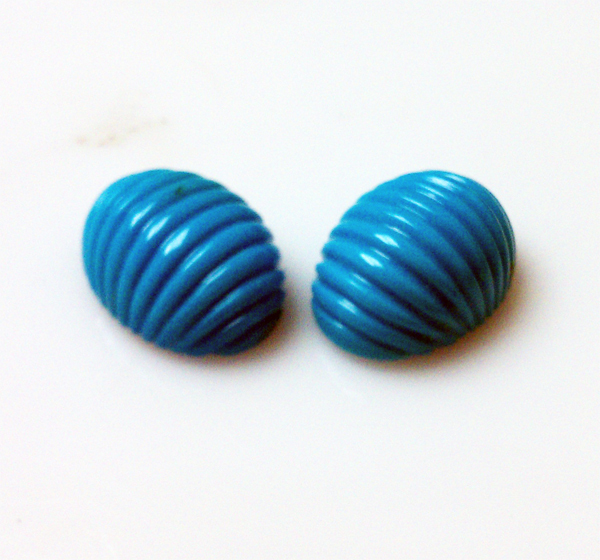 I inlay them into each whole and add a bit of epoxy into the hole and stick the onyx in them and wait for them to dry. 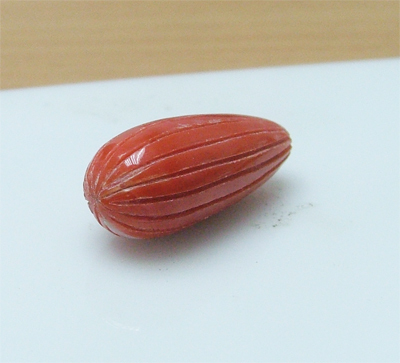 Take a look at the images to get a better idea on what I’m talking about. 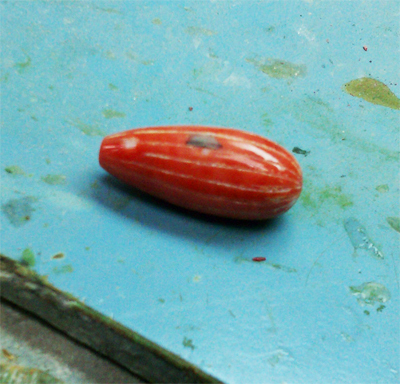 I’ve reached the point where I see the finish line in the horizon and it’s time to shape these two beads with my cabochon machine and give it a nice shine. 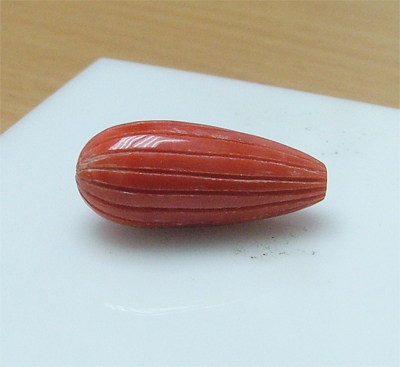 Once I’ve given the beads a nice rounded edge on both sides, I start the polishing process to give it that flush and smooth surface this ‘Apotropaic’ deserves. Done! I hope it was this blog was a good read and fed you information about different cultural beliefs and their practices and how a simple charm or jewelry could be found hanging on your rear view mirror. Till next time! Hello bloggers out there! Welcome to my first ever blog! I’d like to start off by saying, bare with me, the information will only improve as the blogs keep rolling in. 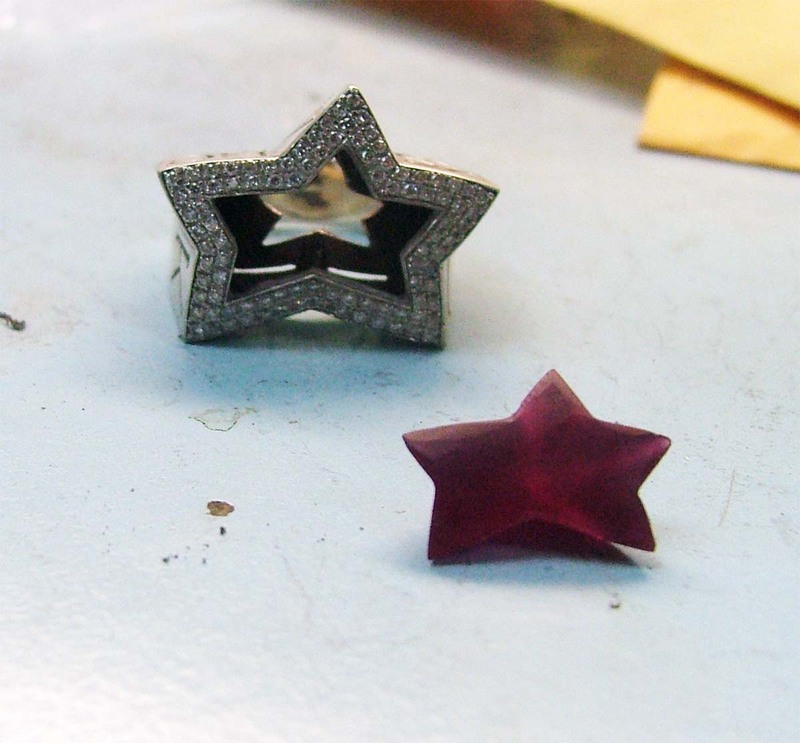 As promised, I received a very custom style job that needed a matching style, star cut, cabochoned on top with each star groove on the pavillion to be cabochon as well so when you look at it from the top, you’ll get this star outline look as well (it’s hard to explain until you see some of the photos which is laid out over this blog). 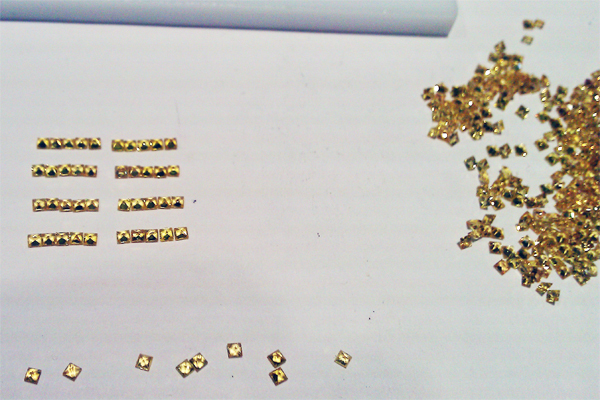 The customer wanted me to supply and cut synthetic ruby matching the sample. 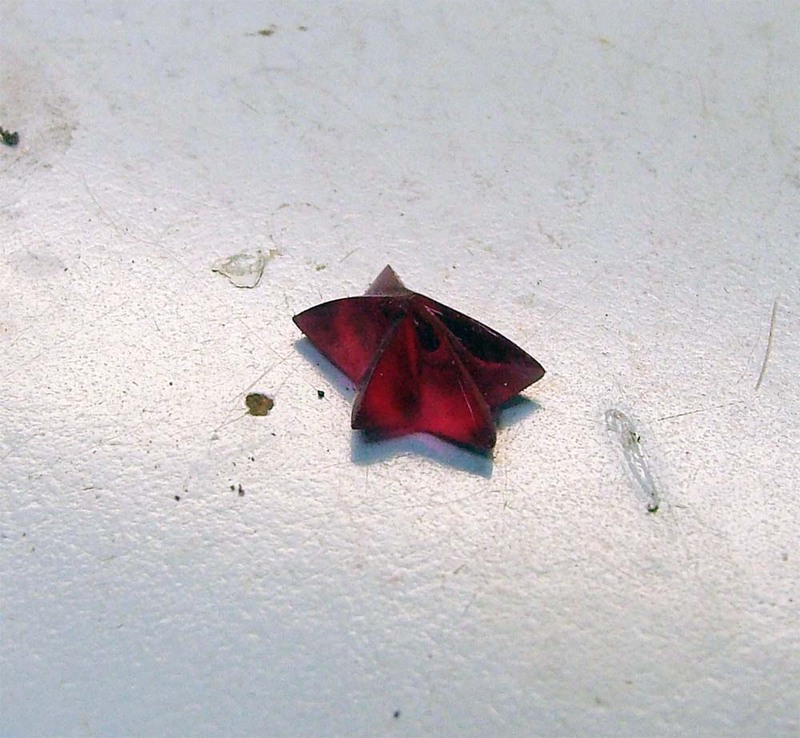 I grabbed a small piece of synthetic ruby rough that matched the color they were looking for. I had the broken sample to go by as a helping hand so life would be easier on me. 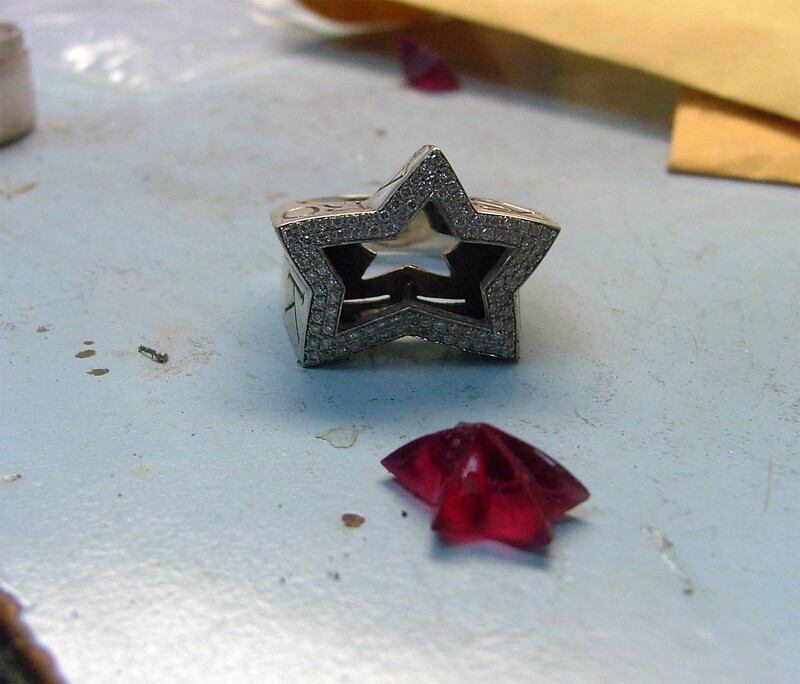 I got a piece of non transparent tape, stuck it on top of the white gold ring and I started to shave out the outline of the star with a small file in order to get the correct size of the synthetic ruby. I get on my lap machine and I start to shape this piece of rough until I get close enough to the outlined area of the tape. 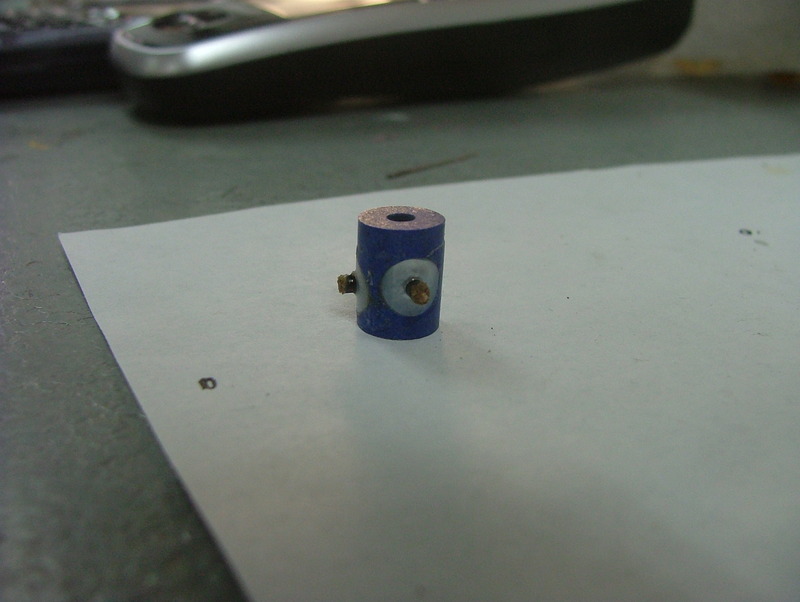 I quickly moved to my bench and started to use my various drill bits to get that angled groove that the sample has. After countless hours of getting it as close as possible to a point where I have to start using my cabochon machine to get that flush, slightly domed look I’ve been aiming for with a transparent view from top. I’ve decided to take a break from this job for a day or so and work on pending work to meet deadlines. I hope you’ve been enjoy some pictures of how I’ve started this job and where I stand so far. It’s been a few days since I’ve touched this job but I’ve decided to pick up where I started with it. 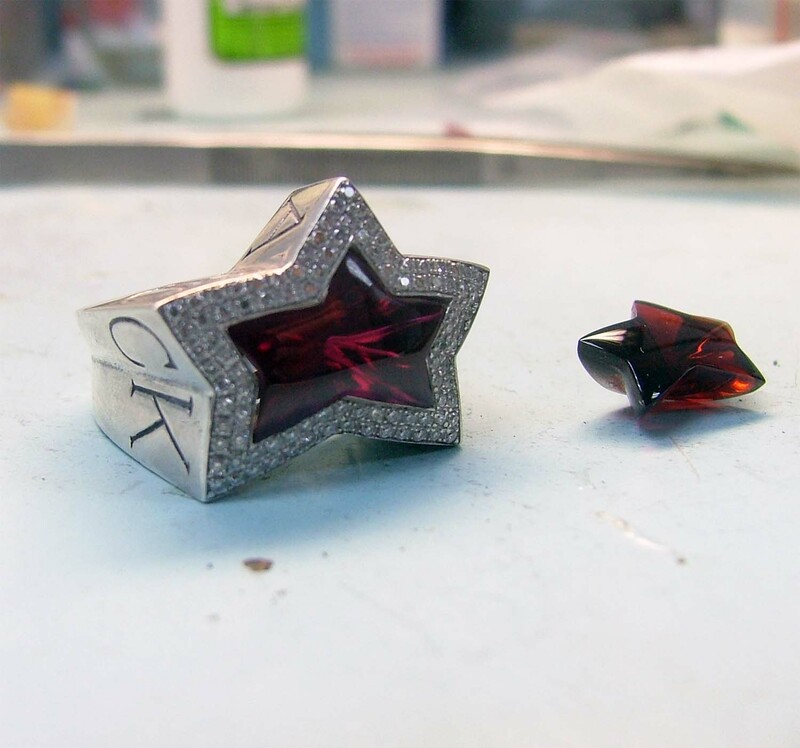 I started with the top of this synthetic ruby and I started to add that diamond powder to that lap wheel to give it that shine and you start to see it open up. Translucent is what we are aiming for. The stone itself is pretty opex in rough form, but what I’ve done is open a window on top of the table and the translucent look is starting to come to life. So far so good. Now, I need to add a slight dome. How to accomplish this? 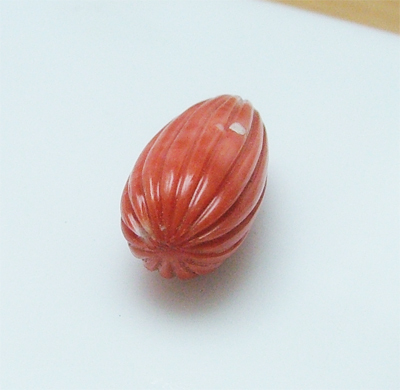 With both thumbs and index fingers, slightly rock the stone back and forth. You need a bit a rhythm to accomplish such moves. I suggest you pick an instrument or a metronome and see if you can keep that ‘four four’ time signature beat going. This also requires a bit of feel as well in order to get into that groove. Plus, you need to be a pretty ‘hands on’ guy. 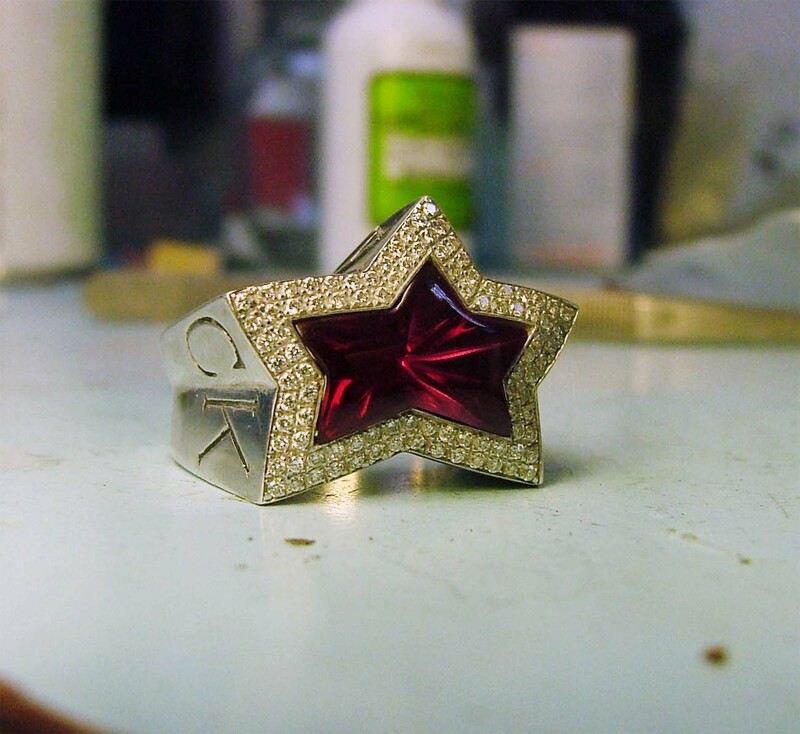 Anyway, I grabbed my ring, and I let the synthetic ruby just sit in the star shaped mounting. 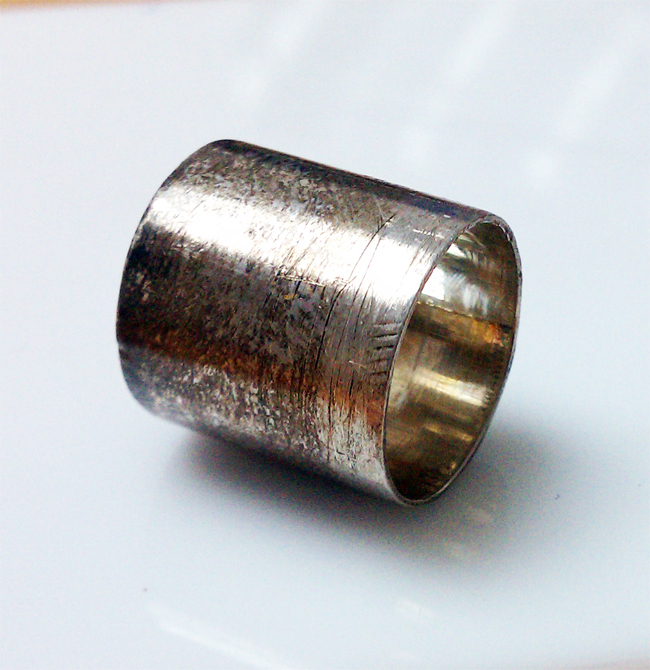 I gave it a sideway glance and you can see it slightly domed, buffed and polished. The window I opened looks good. All I need to do now is to open ten widows that lead all to one point. Sounds a bit easy? Think of it as if I’m doing surgery on a starfish and I need to be as delicate while opening windows on each side to complete this job. 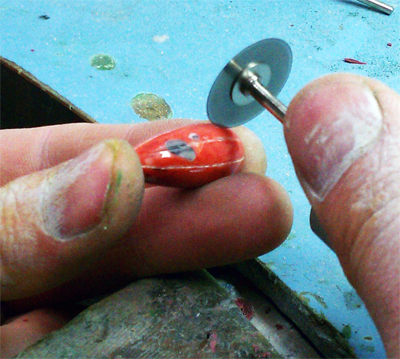 I change out the wheel on the lap machine, going for a rounded disk wheel, leaving me with the difficult task of trying to open up the cleavage area of each side of the bottom of this synthetic ruby. I go with my drills, change out the drill bits, mickey mouse a certain drill bit with some polishing cloth and the windows just opened up. 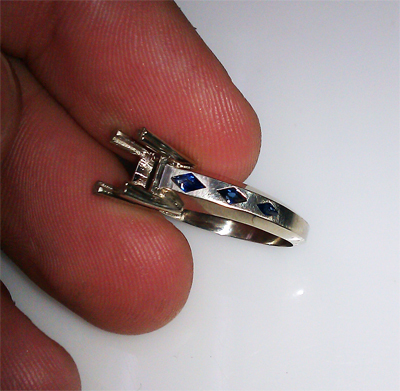 I’ve left out technical details so I can still remain the ‘go-to’ guy here for all gem cutting and inlay lapidary needs. Enjoy the photos and hopefully I explained myself pretty well. Until next time!